We Orthodox live Christ in the Divine Liturgy, or better yet, Christ lives within us in through the duration of the Divine Liturgy. The Divine Liturgy is a work of God. We say: “It is the time for the Lord to act” (Psalm 119:126). Among other things, this means that now is the time for God to work. 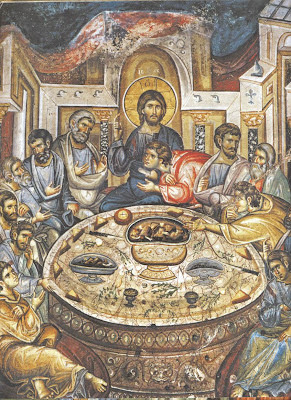 Christ liturgizes, we live together with Christ. The Divine Liturgy is the way that we come to know God, and the way that God comes to know us. Christ accomplished the Divine Liturgy once, and this has passed unto eternity. He overcame corrupted human nature in the Divine Liturgy. We come to know Christ specifically in the Divine Liturgy. 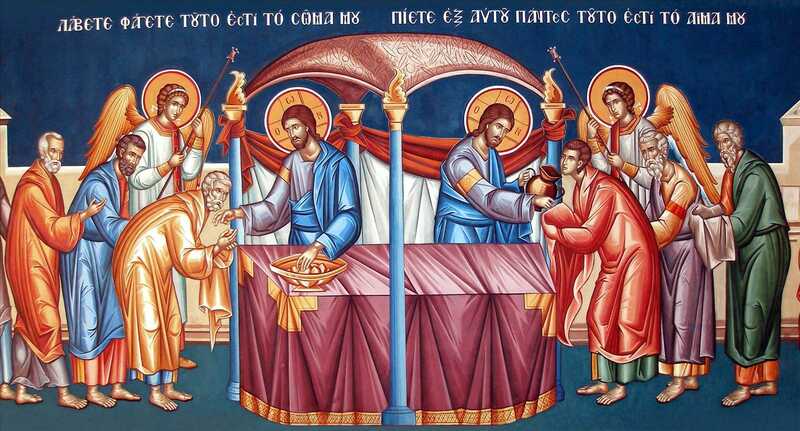 The Divine Liturgy that we celebrate is the same Divine Liturgy which Christ worked on Holy Thursday at the Mystical Supper. Chapters 14-17 of the Gospel of St. John are a Divine Liturgy. Thus we understand the Holy Scriptures in the Divine Liturgy. 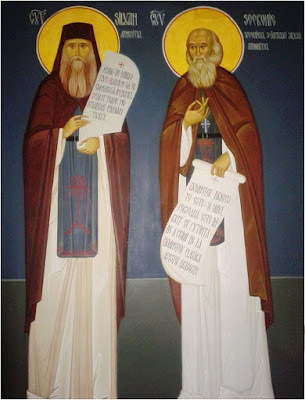 The first Church lived without the New Testament, however, not without the Divine Liturgy. The first forms, hymns, scriptures exist within the Divine Liturgy. 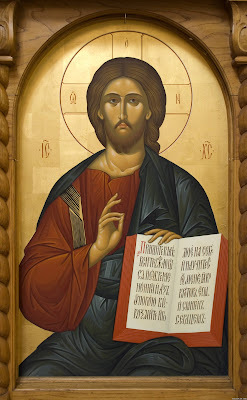 In the Divine Liturgy we live Christ, and we understand His word. 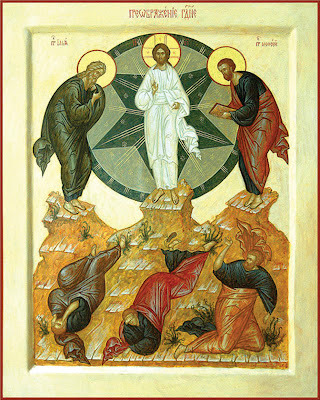 As Christ cleansed His Disciples with His work and told them: “Now you are clean by the word that I have spoken to you” (John 15:3), and He cleansed the feet of the Disciples with water during the Holy Niptir, thus the first part of the Divine Liturgy cleanses us that we might later sit at the Table of love. The purpose of the Divine Liturgy is for us to partake of Christ. The Divine Liturgy teaches us an ethos, the ethos of humility. As Christ was sacrificed, thus we must sacrifice. The form of the Divine Liturgy is the form of He Who became poor for us. 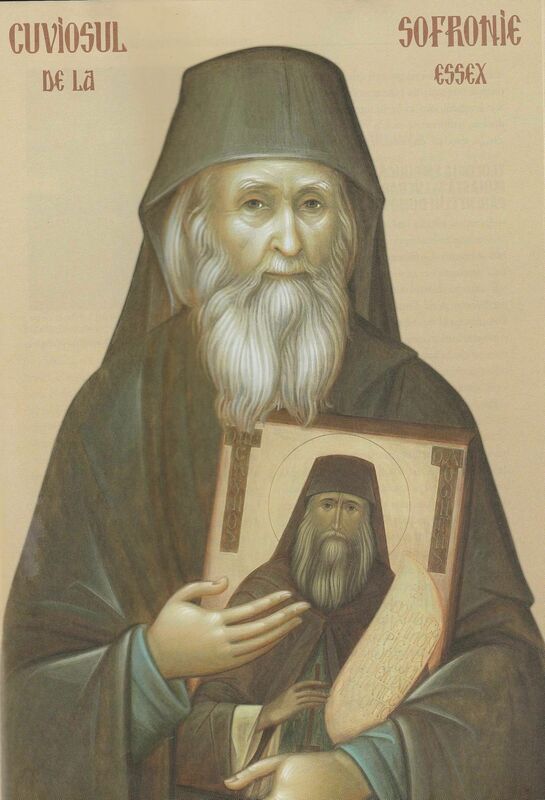 In the Divine Liturgy we try to humble ourselves, because we have the sense that there exists a humble God. 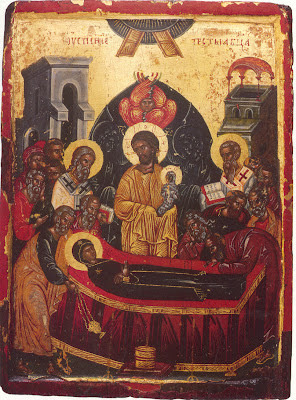 Every Divine Liturgy is Theophany [The Revealing of God]. The Body of Christ is revealed. Every member of the Church is an icon of the Kingdom of God. Blessed Theodora also narrated that one monk asked Abba Isiah: Why is it that those who live in the world with their negligence toward fasting, neglect for prayer, running away from vigils, and lack of humility; with their taking pleasure in food, living according to their passions, ‘devouring’ each other, spending the entire day cursing and swearing – how is it that they do not fall, and do not even say that they sin? 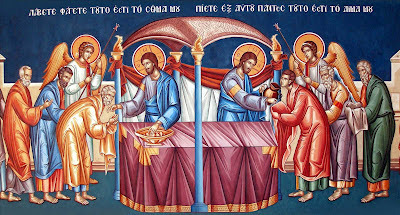 Yet we monks, with our fasts; vigils; sleeping on the ground; eating only bread; abstinence from wine, oil, and all bodily comfort; with mourning and sobbing – we say we have lost our souls, have deprived ourselves of the Kingdom of Heaven, and are condemned to torments? Are not the Law and the commandments given to everyone equally? The good Father shed tears and sighed from the depth of his soul and said: You said well, my son, that worldly people do not fall. This is because after they have fallen once, terribly and bitterly, they cannot get up nor do they have any place further to fall. The devil has no need to wrestle or fight against those who are always lying down and never get up. Monks – at times vanquishing and at other times being vanquished; attacking and attacked – they still antagonize the devil. Worldly people, because of their senselessness and ignorance, because of their love for the world and worldly things, remain in their first downfall, not even seeing or realizing their fall. You must understand that not only do you and I – we who only seem to be monks, while not living the monastic life – have need to always weep and lament, but even the great Fathers – in other words, the true ascetics and hermits – had need to be constantly weeping. Listen to this carefully and judge for yourself. Lying is from the devil, as says the Lord (Jn. 8:44). To look upon a woman to lust after her, He put alongside fornication; to be angry with one’s neighbour, He equated with murder, and declared that there is need even to account for every idle word. Who is he, or where do we find anyone who never was tempted by a lie; or by lust for a woman, and was not stained; and would not therefore have need of repentance? For all have sinned, and come short, of the glory of God (Rom. 3:23). However, know this, that whether one is a monk or a layperson, a bishop or a king – unless one gives himself totally to the Cross, in other words, gives himself to asceticism in humbleness of mind, he cannot be a true Christian. The Lord Jesus Christ our God beatifies such when He says: Blessed are the poor in spirit for their’s is the Kingdom of Heaven (Mt. 5:3). He did not say the “rich,” but the “poor.” Again: Blessed are they which do hunger and thirst after righteousness: for they shall be filled… Blessed are they that mourn: for they shall be comforted (Mt. 5:6,4). So where is mentioned here those who lord over luxurious tables and all worldly things, and live in dissoluteness and excess, and enjoy everything to satiety, with laughter, with obscenity, and without fear of God? There are some unfortunate people in the world who say that fasting is demanded only for monks, along with all sufferings and the heavy yoke; people in the world can have pleasures, rest and all sorts of comforts. O you senseless and slow of heart! Do you not hear what the Lord says: Blessed are they which do hunger… for they shall be filled (Mt. 5:6), and Woe unto you that are rich! for ye have received your consolation. Woe unto you that are full! for ye shall hunger (Lk. 6:24-25). And Enter ye in at the strait gate: for wide is the gate, and broad is the way, that leadeth to destruction, and many there be which go in thereat: because strait is the gate, and narrow is the way which leadeth unto life, and few there be that find it(Mt. 7:13-14). This and all similar words are meant not for monks – because there were as yet no monks when Sweetest Jesus our God was teaching this – but for people living in the world, those who lead a bustling life, filled with material love. If the Lord was teaching this only for monks, then people in the world are more to be pitied and more unfortunate than even animals, since they would thereby be deprived of the holy commandments and the Beatitudes. If the Law is common to all, then common too are the yoke and the Beatitudes, the Judgement and Hell. When the monk heard this from the Abba, my good Teacher, he was struck with amazement, and sighing deeply he fell to the feet of the honourable Father and said: So, holy Father, we need great labour, much sweat and asceticism. Pray for me, holy Father. And the Abba blessed him and let him go. 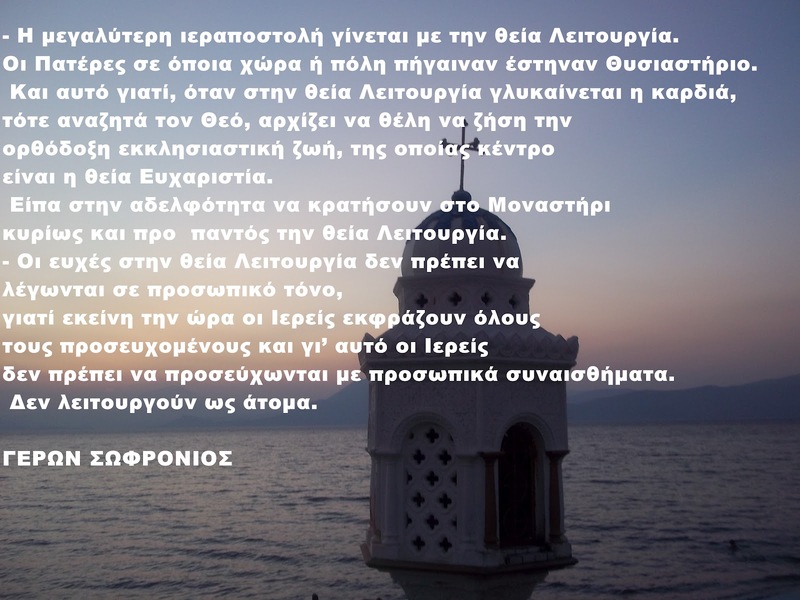 (Taken from the book Matericon: Instructions of Abba Isaiah to the Honorable Nun Theodora pp. 81-83, published by St. Paisius Serbian Orthodox Monastery; http://lessonsfromamonastery.wordpress.com/2012/08/19/this-is-a-hard-saying-who-can-hear-it/). The greatest missionary activity occurs with the Divine Liturgy. When the Fathers came to any place or city, they set up an Altar. 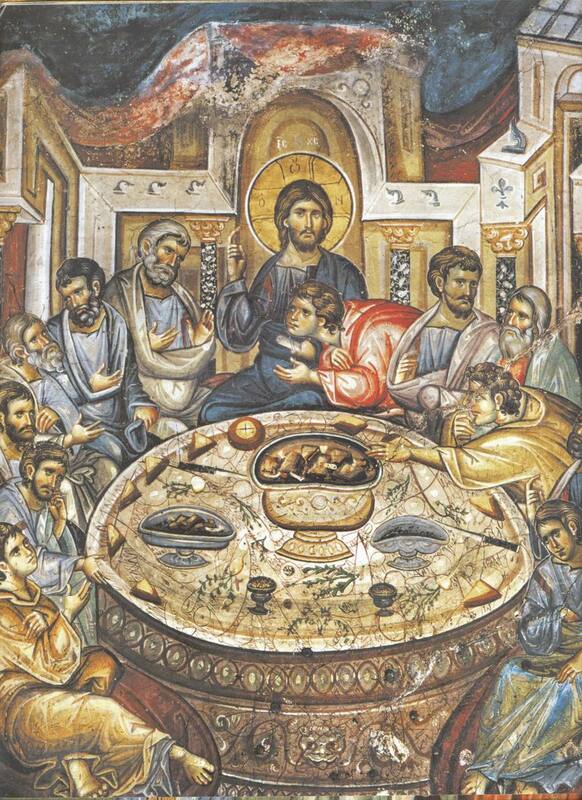 And this is because, when in the Divine Liturgy the heart is sweetened, then one seeks God, and begins to desire to live the Orthodox ecclesiastical life, whose center is the divine Eucharist. I told the brotherhood to keep in the Monastery first and foremost the Divine Liturgy. The prayers in the Divine Liturgy should not be said in a personal tone, because at that hour the Priests speak for all those who are praying, and because of this, the Priests should not pray with personal emotions. They do not serve as individuals. This is the final goal of the covenants God has made with us; this is the revelation of the hidden depths of God's incomprehensibility. This is the realization intended before all the ages; this is the crown of God's oracles, the inexplicable, supremely unknowable will of him who had cared for humanity since before creation began. This is the first-fruit of God's communion with his creation, of His identification as Maker of all things, with what He has made. This is the concrete, personal pledge of God's reconciliation with humanity, the surpassing beauty of God's sculpture, the perfectly-drawn portrait of the divine model. This is the first step to all ascent, to all contemplation; the holy tabernacle of him who made the world; the vessel that received the inexhaustible wisdom of God; the inviolate treasury of life. This is the spring of divine radiance, which can never be drunk dry; the impregnable stronghold, raised so high over all of us in its purity that it can never be conquered by passion. Through this woman [the Theotokos], the pledge of our salvation has been made and kept, in that this marvelous creature has both reach the limits of our lot and has paid the common debt proper to our nature. And if not all the features of her life were the same as ours, that is due simply to her nearness to God.